I’ve always had Thanksgiving dinner at my house, since 1983 when my mother handed over responsibility to me. But this year, since our house was still under construction after 5 months, Lindsay and Nolan agreed to take over. We still did the turkey and ham and stuffing and cranberry chutney but we carted it all down there for the feast. Lindsay started to think about the timing of all the different things that had to be done to make the meal a success and she said, “We should mind map this!” I thought it was an odd idea to use a mind map since everything would be pretty much sequential but she explained why it was the right tool for the job. She said, “You know how in your presentation you explained that mind maps are a great way to get ideas down that are all jumbled up and then organize them later?” She went on to point out that she knew she had these 12 things to cook, but didn’t know what order they would need to go into the oven and barbecue. She opened up iThoughts from Toketaware, and just started dropping in nodes for each food item. Then she started figuring out the times for each item, like when did she need to preheat the barbecue for the turkey or pull the turkey out. This left her with three levels: Food item, then time, then what to do to the food item. After she was done putting all of that together, it was time to reorganize it into a completely different format. 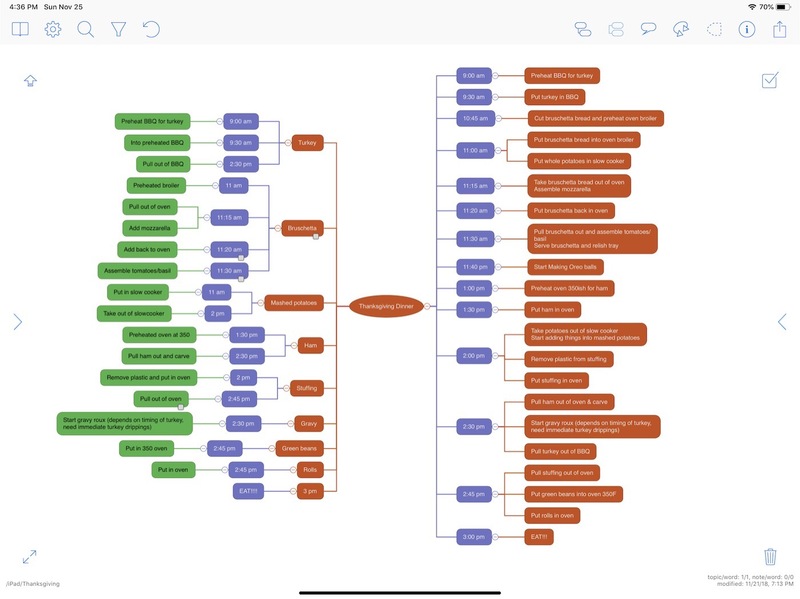 She copied and then pasted all of the nodes right back into the same mind map. The left side was the original method while the right side started with the times, then what had to happen at that time. It was easy to then rearrange the nodes to be in order by time, This was going to be the new master by which things would actually be executed. As she executed each step, she tapped on the node, and changed its color to black, and iThoughts automatically switched the text to white so you could still read it. I wouldn’t have picked black but it really worked! I love that my daughter is a geek. I love that she thinks of things very differently than I do. But I love most of all that she actually listens to my technical blabbing and learns from me and then improves on what she learns. This is too cool, makes me kinda wish I actually cooked more.